List Rules Upvote the weather you'd least like to encounter on your commute home. There are plenty of crazy weather patterns that seem too insane to even be real. Have you ever heard of a fire tornado? How about a waterspout vortex opening up over a gloomy sky? Some of the most insane, terrifying weather happens right here on Earth, not just in outer space or in movies. When the sky opens up and brings forth a most unexpected surprise - whether it’s a typhoon, a brinicle, or a blizzard carrying 45 twisting tornadoes - these zany weather conditions teach us a lot about where we are as a society. These are weather patterns that make history, forge the future, and freeze time as it stands. Here’s a look at some of the most insane weather on Earth. This strange, funnel-shaped type of precipitation is rare enough on its own. Add to it a second spiraling vortex though, and you really have quite the phenomenon. In Lake Michigan, multiple vortexes are a common occurrence, with up to nine happening at the same exact time right next to one another. 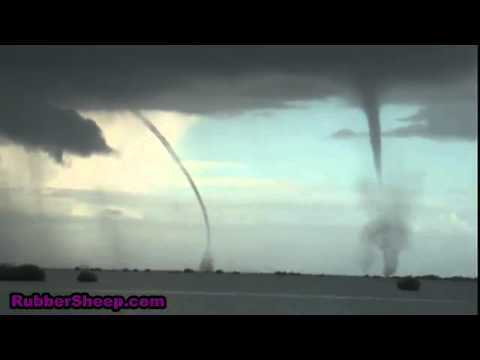 These waterspouts, or intense vortexes, are typically powered by non-super cell tornadoes and are common to tropical and sub-tropical climates. At their onset, these storms are easily identified by the circular pattern they form over the water before the reach maximum capacity. They’re notorious for overturning boats and inducing nautical injury but depending on their tornado-like nature, they can cross over to land to add a devastating twist. Legends of fire tornadoes spread far and wide through the 18th and 19th century, but said suspicions weren’t technologically confirmed until 2003 when a brush fire gathered up a tornado and wreaked havoc on an Australian suburb. A spinning, fire colored spectacle is created whenever ground level winds brush with fire. In reality, the swirling effect has nothing to do with a tornado at all. It is the fire itself that reacts this way to gusts of wind because heat rises. 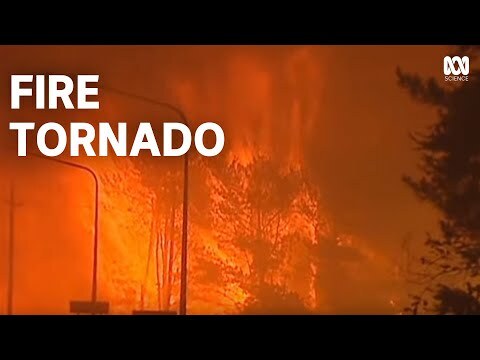 Firenados are relatively short-lived storms, but they can still cause tremendous damage with 2,000 degree wind moving at speeds of over 100 miles per hour. The most notorious firenado (which was previously believed to be a freak accident prior to the confirmation of such types of hazards) took place in Peshtigo, WI, in 1971. It burned more than a million miles of acreage and claimed over 1,500 lives. The 1930s got their nickname “Dirty Thirties” when a tremendous dust storm known as the Dust Bowl swept over the Great Plains and ravaged for 100 million miles. The visual effect of such weather was what we today might call post-apocalyptic. The massive dust cloud hovered for an entire decade, causing drought, disease, and financial devastation, and it was caused by human interference. A combination of overplowing and overgrazing turned out to be the leading factors in this outrageous pattern. Twenty years later in the 1950s, a mini version swept the region for five more brutal years. The most colossal tropical cyclone in Earth’s recorded history broke records when it hit Japan, causing the lowest recorded sea level pressure to occur. Typhoon Tip, measuring 1,380 miles in diameter and carrying with it 190 mile per hour winds, was a record-breaking storm. It wasn’t just the largest of its kind but also, it was the largest of any kind of storm to date. Amid the wreckage were 86 human fatalities and 20,000 residences.